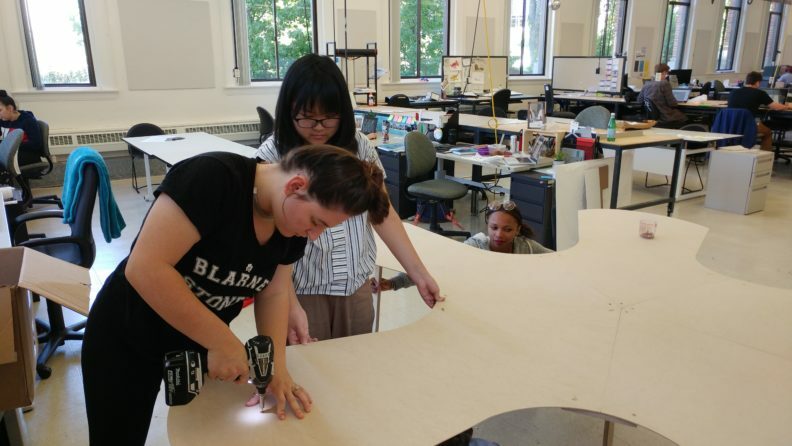 Sarah Rosenthal, left, and Kris Kha work on a prototype of the “Bench of Belonging,” which his scheduled to be installed in the Spark early next year. Give students from interior design, animal sciences and accounting/marketing an open-ended project with little direction and no restrictions and you’re bound to get some off-the-wall ideas. But that’s half the fun of the Creative Corridor program. When grades aren’t in question and diverse perspectives are prioritized, the creative juices flow. Kris Kha, Sarah Rosenthal and Shannon Spilker began thinking way outside the box after they were tasked with creating a “Bench of Belonging” on the WSU Pullman campus. The project is part of the Creative Corridor program, which brings students together with faculty and staff to tackle unconventional creative activities. The projects are not tied to curriculum, and are meant to provide hands-on experiences while activating maker spaces around campus. Once reined in a bit, the students honed in on an idea that is close to becoming reality. The asterisk-shaped “Bench of Belonging” is scheduled to be installed in The Spark this spring. The Bench of Belonging experience allowed three undergrads from different majors to collaborate on a piece that will remain at WSU in perpetuity. Kha was perhaps the least likely contributor to the “Bench of Belonging.” Her Human Development professor noticed her impressive drawings in class and recommended the project, not realizing Kha was an animal science major. The bench is one of several ongoing Creative Corridor projects and events. Last spring’s Adobe Creative Jam in the Spark drew nearly 200 students. They competed in a creative design competition while engaging with technology, and peers from across campus, in ways classroom interactions can’t provide. Another Creative Jam is scheduled for next semester as The Spark will welcome a pair of WSU alumni who specialize in helping students market themselves and prepare for their professional careers. Other ongoing projects include a virtual tour of the Bryan Hall Clock Tower using a 3-D camera, an art project in the Spark made of 3-D printed replicas of the Cougar head stamps on Todd Hall, the “Cougar Canjo,” a banjo made from an empty Cougar Gold can, and several others. Students and faculty are clamoring for more hands-on educational opportunities, according to Jon Manwaring and Lisa Johnson-Shull, who have helped the Creative Corridor get off the ground. “My vision for the Creative Corridor is a well-connected network of people and spaces that can help bridge those silos that seem to be inevitable in higher education,” says Manwaring, assistant director for Academic Media Services, and one of the first collaborators on the project. Students, faculty and staff interested in getting involved in, or creating a Creative Corridor project can contact Manwaring at jmanwaring@wsu.edu.